'Captain Crunch' Uncle Bill's first and only tugboat - isn't she a beaut? So here I am again, way behind in posting. Lots of stuff going on, tomorrow we are heading to Victoria (and on to Duncan) for the week. (Sorry Mom W you can't be with us.) Rachel will meet us up there on Tuesday. If the weather gets nice maybe we'll even head to Cowichan Lake for a ski and tea (that's to entice all the far away Miners). So for now, here are a couple pics from the last couple weeks. Kyle doesn't stop his woodworking even for the holiday. Manchester Park for a picnic and a swim, maybe. Too cold and too much seaweed. 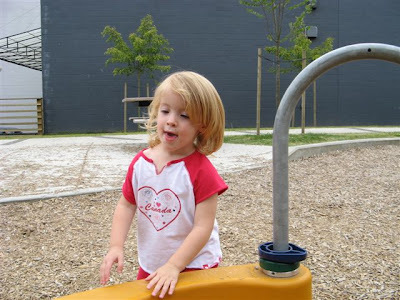 Actually, we visited this park again a couple weeks later with my parents and she did get in and made me get in too. It wasn't too bad but I prefer to leave the cold water tasks to Kyle. Thought I would put up some pics from our visit with the Howards in Vancouver two weeks ago. As some of you remember, Jake and Lillian are 11 days apart and we spent a lot of time with them those first 6 months. They've come along way since then. Wonder what the pictures will look like from the next visit? Finally I'm able to post this. Enjoy. We sure loved the rolls. Now it's time to make some more!